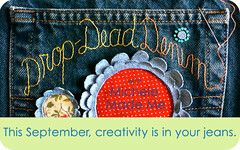 Thank you for inviting me to join in on your denim fun, Michele! When Michele approached me about creating a recycled denim tutorial, I couldn’t say no to the challenge but fear was right there too. I get nervous stitching through all those layers of denim! 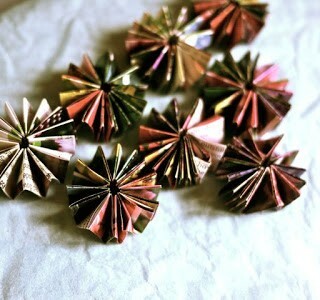 As I was sewing my project, I found myself leaning back and squinting, expecting a needle to break at any moment. I considered safety glasses. Twice my thread broke and twice my machine displayed a message “Stop for safety sake.” But all in all, it was lots of fun creating this free pattern for you! I’d like to introduce my Upcycled Denim Pillow Play! The theme here is the Three Little Bears but the options are endless. Papa bear can be hidden in the Papa sized fly; and Mama in the Mama sized fly. Baby fits in the Baby sized pocket. Goldilocks has a roomy back pocket all of her own but we know that won’t satisfy her right? She will want to try them all out! The pillow is backed in an adorable print, just perfect for this project, called Appleville Houses in Bright from Suzy Ultman. I could picture the Three Little Bears living in any one of those houses. 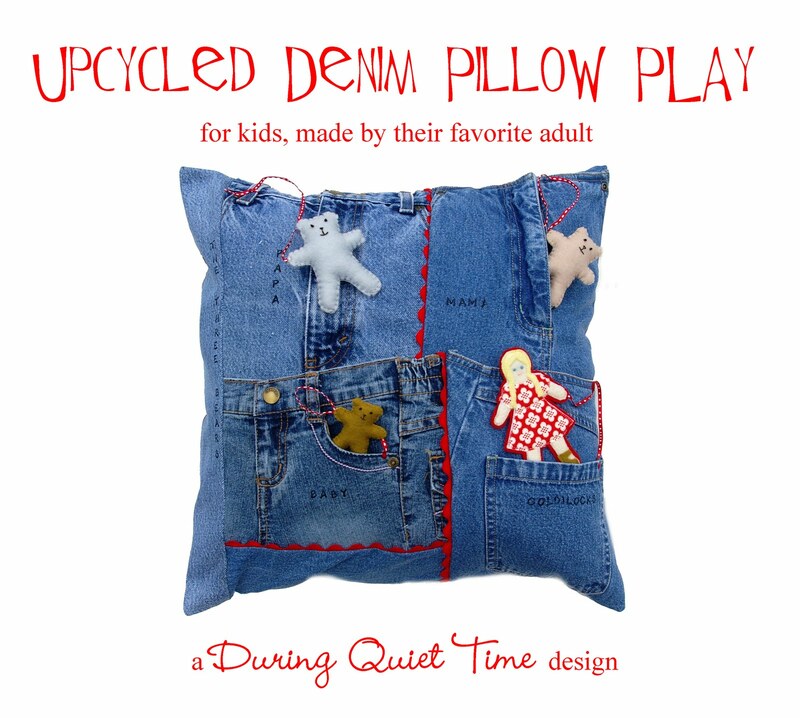 If you’d like to make a little pillow front theater, just collect some jeans, download this pdf and you are on your way! 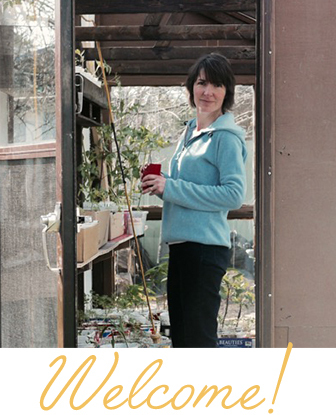 I’d love to have you pop over to my blog for a visit. 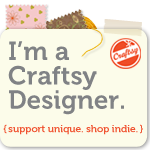 I also have an Etsy shop where I sell my handprinted fabrics and patterns. There’s not a stitch of medium in this little pillow. It is downright hot AND totally cool all at the same time! Also, it’s unBEARably cute, don’t you think? I want one. Amy, have I told you lately that you rock? ‘Cause you rock. You rock big time. Thanks for rocking. I’m ecstatic that you agreed to play along in my denim game. It’s always such a pleasure watching you go! And I hope YOU have a fine fine day. I’ll be back here on Friday with MORE denim! Yippee! « Drop-Dead Denim Guest: Mich L. in L.A. This is so cool! Amy is so talented. I applaud her for coming up with this gorgeous pillow. I think lots of Moms would love to make their little ones this Little Bears pillow play! This is so adorable!!! I love that it can be used to rest on and to play with. Such a great idea!!!! Love it!!!! Oh this is fun! 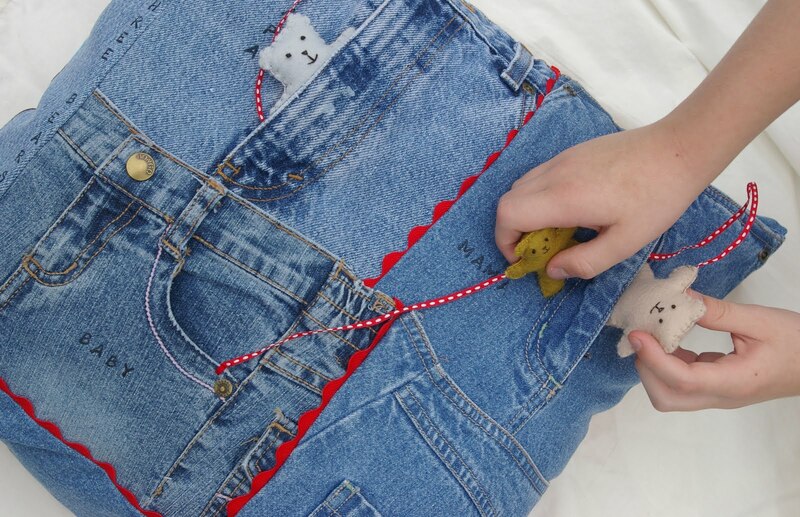 A cute way to use front and back part of jeans and actually give purpose to those pockets!! So so fun! I love all the secret hiding places, a fantastic kid project! What a fabulous idea. I think I may have to make one for my son's new room. I would have been just as scared of breaking needles!! That's a great machine message. Mine once told me "Fabric Too Thick" (while making an Amy Butler bag, I was trying to sew through about 6 layers of heavy interfacing!). I think the machine wanted to say "operator too thick". Your pillow design is so utterly adorable and original, Amy. Way to go!!! Love the way you used all the jean parts not normally utilized on projects. Great idea. It is just so cute. Love it! Impressive! 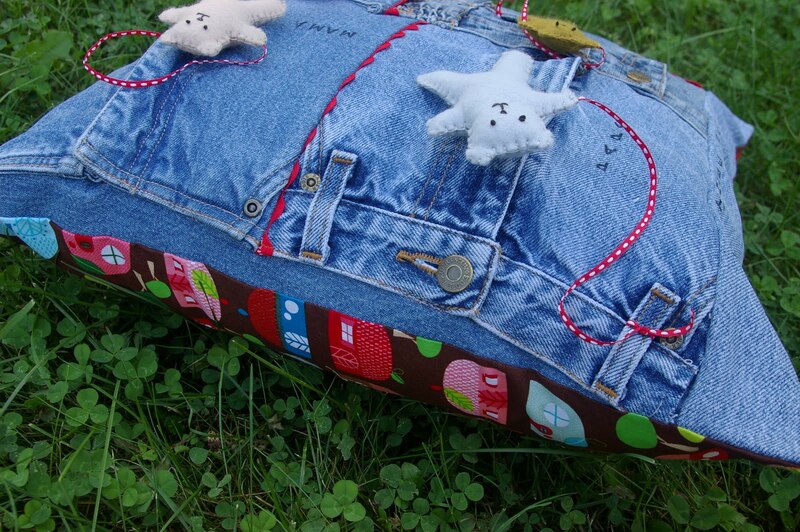 What a fun and cute pillow! This pillow is so sweet. I love that there's a lot of pockets to hid little toys. My daughter would love this! Really enjoying the Drop Dead Denim series. This is just great! I make tactile educational resources for visually impaired children on our caseload and this would be a lovely one to recreate for them. Theyd have to track for the pockets to find and then replace the teddies. The nursery rhyme is central to much of the pre school work so I must try and fashion a similar one for both work kids and my grandson! I suppose you could have a grown up womans version with laminated pics of Johnny Depp or George Cloony on the end of the strings! Great job! I can imagine little hands having lots of fun with all the pockets and openings. 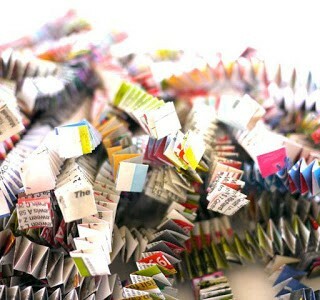 Hats off to you for sewing through all those thick layers! I can see this one as a starting place for an advent calendar for very young children! What a cute, fun thing for kids! 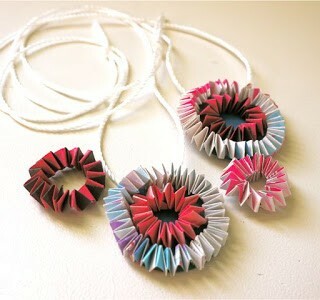 I'm going to put a link to this on my Homemade Gifts site.